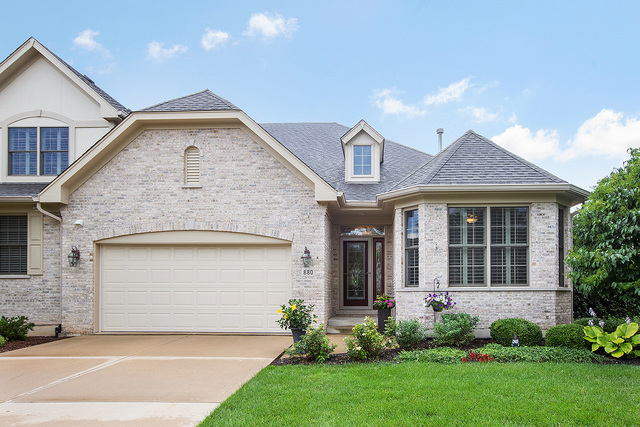 Stunning, exceptional brick ranch duplex on a premium lot shows like a model! 3 bedrooms, 3 baths and a full finished WALK-OUT lower level in sought after upscale subdivision. Extensive upgrades and high end finishes and fixtures are evidenced throughout. Light and bright home with beautiful neutral decor. Gleaming hardwood floors, architectural columns flank the formal dining room with decorative ceiling, chef&apos;s kitchen boasts furniture quality cabinetry with extensive finishes with above and under cabinet molding and lighting, granite counters, onyx backsplash and stainless appliances. Glorious sunroom with picturesque views of the lush backyard. Beautiful master suite with his and her walk-in closets and a lavish master bath. Professionally finished WALK-OUT lower level with a large rec room, game area, 3rd bedroom, full bath and a storage/workshop room. Large maintenance free deck and concrete patio overlooks the lush landscape. Prime location near METRA, shopping and dining.